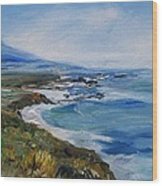 Queen duvet cover (88" x 88") featuring the image " Big Sur Coastline" by Eric Schiabor. Our soft microfiber duvet covers are hand sewn and include a hidden zipper for easy washing and assembly. Your selected image is printed on the top surface with a soft white surface underneath. All duvet covers are machine washable with cold water and a mild detergent. 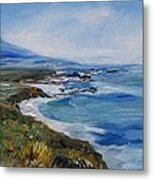 This is a limited print series of California coastline work and is in my impressionism seascape collection. 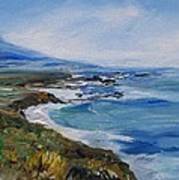 In this pacific coastline painting the cooling blues of the water contrast the action of the waves against the shore and rocky coastline . the clifts of the shoreline fade to give depth to the beach.The C Big Sur Coastlinealifornia mountains rolling in the distance, contrast against a light blue sky and clouds. 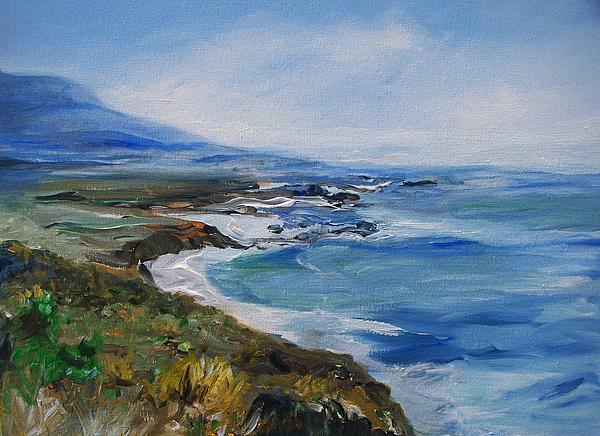 the foreground has some green and yellow to give some bright focal point to the foreground.